My name is Cheetah and this is my web site. I thought I'd tell you a little about myself, and about Exocrine Pancreatic Insufficiency (EPI), a potentially fatal disorder that afflicts some dogs, especially German Shepherds like me. Fortunately - and this is not as widely known as it should be - EPI can be treated very effectively and inexpensively. I know because I have been receiving this treatment since December 2000 and I am extremely healthy. I was born in the spring of 1996 and when I was about one year old I was put into the world-famous Battersea Dogs' Home in London. While I was there I had a couple of trials with the RAF (I wanted to be a fighter pilot) but I think I failed the medical. The staff did their best for me but I didn't enjoy my stay in Battersea very much, fortunately I was only destined to be stuck there for a few weeks. Frankly, I am amazed that a dog of my nobility and regal bearing was in the Home for so long especially as everyone who meets me says I'm 'the most beautiful dog in the world.' I feel very sorry for those dogs that have to spend many months, or even years, in Battersea. Anyway, I was taken home by two humans to join their family pack. I settled into my new home very quickly (about ten seconds) and immediately realised that these humans badly needed my help. Every time a stranger walked past the house they did absolutely nothing, neither of them even gave so much as a mild first alert bark, so clearly all the barking was going to be up to me. Such poor security is against my nature, I take my job very seriously. My human family are very friendly but have no idea about security at all. For example, they have still done nothing to block up the hole in the front door. Twice a day an intruder sneaks up our path and pushes squares through it and it's only my barking that stops him from trying to get in through the hole. Mind you, it's very easy to tell when he's coming as every day he turns up in the same rattling, smoky, red van, so I hear him coming a mile away. One night I went for a walk with one of my human family when a couple of hooded youths crept up very quickly and silently behind us. I don't think they had seen me because it was very dark and I was in the shadows but it was absolutely obvious what their game was so I leaped between them and my friend and gave them one of my extra-special blood curdling low growls. They silently crossed the street and sped off. We don't expect to see them again. I have got lots of other stories but they will have to wait till another time because I want to tell you about my pancreas disorder as there doesn't seem to be much about it on the web. For several years I had only been able to eat Waltham Canine Selected Protein Chicken and Rice (now known as Waltham Canine Veterinary Diet Sensitivity Control) otherwise my tummy became upset. In the autumn of 2000, even though on this strict diet I developed a sensitivity which could be controlled only with broad spectrum antibiotics. Even Lactosym, which I had relied on previously had no discernible effect. The result of this was that my weight plummeted by one kilo per week. In short, I was starving to death and everyone thought I was going to die. Fortunately due to the treatment that I'll describe in a moment I am now back to my correct weight of about 75 pounds and very fit, happy and healthy. In December 2000 I was diagnosed from a blood test as having exocrine pancreatic insufficiency (EPI). 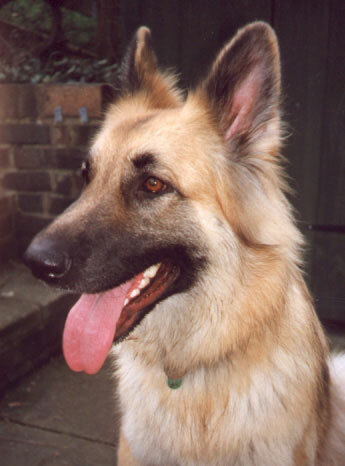 Many dogs who have this condition are, like me, German Shepherds. Although my insulin production is fine, my pancreas is incapable of producing sufficient enzymes to enable me to digest my food properly. Once EPI was diagnosed we were advised that there were only two courses of treatment available. The first consisted of a commercially produced dietary supplement which replaces the enzymes I am no longer able to produce naturally. At £10 per day this is very expensive but fortunately there is a much cheaper alternative. My excellent vet, Barbara Schmidt, then of the Wenzel Veterinary Group but now sadly returned to Germany, contacted Dr. Sean Henney, an authority on canine EPI. Dr. Henney said that raw pig pancreas thoroughly mixed into my Canine Selected Protein food would be even better than the dietary supplement and of course very much cheaper. We experimented with this and discovered that raw pig pancreas, when liquidised and thoroughly mixed into my food, is indeed completely effective at controlling my condition. After we got my condition completely under control we started to very gradually replace the Canine Selected Protein in my diet with Chappie Original, another Waltham product. We are still experimenting with the ratio of pancreas to Chappie and no doubt other dogs with EPI will need different ratios depending on their weight and the severity of their condition. However we have discovered that roughly one part of liquidised pig pancreas to four and a half parts of Chappie does the trick. I also like to occasionally eat a small frozen nugget or two of pancreas as a bedtime treat. Some of my friends who have EPI have reported that cow pancreas also works. If pig pancreas is more effective than beef pancreas perhaps that's because pigs are naturally more omnivorous than cows and therefore their enzymes are better adapted to digesting meat. The enzymes are not damaged when pig pancreas is frozen and then thawed, so it can be stored in a freezer, and if necessary thawed and frozen again. The main problem with this treatment is obtaining the pancreas, as the most practical source of pancreas is a slaughterhouse which usually supply pancreas in frozen slabs. These slabs have to be broken up for thawing which is not as easy as it sounds. The best way to break them is to drop them from a height of several feet onto a hard concrete surface or put them on a solid surface and hit them several times with a very heavy hammer. When I first set up this website I had no idea that it would have so many visitors - usually about 200 per week. I receive a lot of emails with questions about treating EPI so I thought it might be a good idea to include a FAQ answering the more commonly asked questions. I am still very happy to receive emails from you but if you have a question please read the FAQ very carefully to ensure it's not answered there before you email me. Of course, if you have a question which is not answered here I'd be very interested to hear it and I'm also very happy to hear about how you got on with your treatment. We've set up a notice board where owners whose dogs have EPI can chat to each other. To visit the notice board click on this Canine EPI Message Board link. A big WOOF WOOF to all my friends!